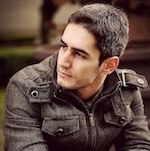 I am Arman, data scientist, entrepreneur, photographer and python lover. I was the co-founder and chief data scientist in Aida, a machine learning startup, where I helped with research and development of AI solutions for natural language understanding in customer support/intelligent segment. Our company was acquired by Vision Critical in late 2017, and these days I work as principal data scientist at VC integrating ML capabilities to VC's customer intelligent platform. I hold a PhD degree in computational physics from UBC where I worked on large scale distributed computing and numerical algorithms for gravitational physics research [+]. My main interest in machine learning is natural language "understanding" and its applications in semantic web. In my free time, I do landscape photography, resistance training, and traveling. I am also pretty addicted to Python and am trying to find my way to contribute to its amazing open-source community. Please feel free to contact me, if you think we have something to chat about! I love intellectual conversations, anything startup, bad puns and good beer!